Access and use of the hotel-perebenoit.com website are subject to these terms and conditions of service, which are binding upon you and with which you are required to comply. We would therefore advise you to read the following carefully. DEBIT DE VINS RESTAURANT STEINKELLER asserts its quality as a responsible company. Access and use of the hotel-perebenoit.com website by people residing in France are strictly reserved for adults. 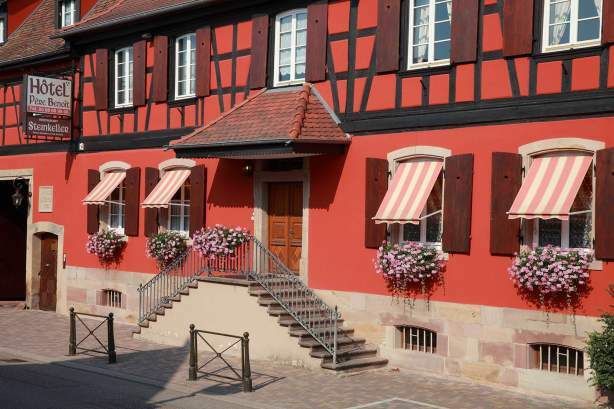 Liability for any violations of the foregoing, especially if users of the hotel-perebenoit.com website incorrectly specify or falsify their age, will be disclaimed by DEBIT DE VINS RESTAURANT STEINKELLER. Access and use of the hotel-perebenoit.com website in other countries and territories, where alcohol consumption is permitted, are strictly reserved for people that are legally authorised to consume alcoholic drinks. Consequently, people residing in a country or territory where use of the hotel-perebenoit.com website is not permitted by applicable law and legislation, or people that have not reached the required age to access this website, are requested to immediately exit the hotel-perebenoit.com website. Photographs, texts, slogans, drawings, images, animated sequences with sound or not and any works integrated into the website are the property of the company DEBIT DE VINS RESTAURANT STEINKELLER or third parties that have authorised DEBIT DE VINS RESTAURANT STEINKELLER to use them. DEBIT DE VINS RESTAURANT STEINKELLER declines all responsibility in the event of a delay in updating, or the interruption or unavailability of the service. DEBIT DE VINS RESTAURANT STEINKELLER reserves the right to correct the content of the website at any time and without prior notice. The user of the website the hotel-perebenoit.com acknowledges having the competence and means required for accessing and using this website. DEBIT DE VINS RESTAURANT STEINKELLER may not be held liable for elements and events beyond its control concerning the use of the website and its effects on material and/or software incompatibilities and damages which may result from these on the user’s technical environment, in particular his/her computers, software, network equipment and any other equipment used to access or use the service and/or information. DEBIT DE VINS RESTAURANT STEINKELLER declines any responsibility for the content of the websites proposed via links, regardless of the type of link from or to hotel-perebenoit.com. DEBIT DE VINS RESTAURANT STEINKELLER reserves the right to oppose it being set up. Data collected on this website, by whatever means, is for reserved use by the company DEBIT DE VINS RESTAURANT STEINKELLER. For your financial transactions, the hotel-perebenoit.com website uses an external payment solution. At no time will your credit card number be disclosed to DEBIT DE VINS RESTAURANT STEINKELLER. The application of such tax is beyond the control of DEBIT DE VINS RESTAURANT STEINKELLER. In the frame of the use of its services and in particular the services accessible on its website, its mobile site, its online store and its mobile apps, DEBIT DE VINS RESTAURANT STEINKELLER, as data processing manager, may collect and process your personal data. DEBIT DE VINS RESTAURANT STEINKELLER undertakes to guarantee a high level of protection of the data of its customers, potential customers, website, mobile site, and online store, and mobile app users, and any other person for which it processes data. DEBIT DE VINS RESTAURANT STEINKELLER implements the appropriate technical and organisational measures to guarantee a level of security that is adapted to the inherent risk of its processing operations, comply with regulatory requirements and protect the rights and data of the people concerned when designing processing operations. Furthermore, DEBIT DE VINS RESTAURANT STEINKELLER contractually imposes the same level of protection of data protection on its subcontractors (service providers, suppliers, etc.). In order to constantly improve the quality of our services proposed on our website, mobile site, online store and mobile apps, and their suitability with your needs, DEBIT DE VINS RESTAURANT STEINKELLER may use “cookies”, text files that serve to identify your terminal when you log in to one of our services. DEBIT DE VINS RESTAURANT STEINKELLER undertakes to store your data for a period that does not exceed that required for the purposes for which they are processed. The storage periods are defined according to the processing purposes implemented by DEBIT DE VINS RESTAURANT STEINKELLER and, in particular, take account of the legal provisions which apply imposing a precise storage period for certain categories of data, any limitation periods that apply, as well as the CNIL’s recommendations concerning certain categories of data processing. The data collected on our website, mobile site, online store and mobile apps are likely to be communicated to our internal staff or to its ancillary service providers (sub-contractors, service providers, banks), in the frame of the completion of all or some of the services listed above. We remind you that in this context, DEBIT DE VINS RESTAURANT STEINKELLER asks its providers to set up strict privacy and protection measures for this data. Data may be processed outside the European Economic Area (EEA). If this is the case, DEBIT DE VINS RESTAURANT STEINKELLER will do everything to ensure that this international transfer of data benefits from the required level of security and guarantees. Ensuring the security and confidentiality of personal data that you entrust to us is a priority for DEBIT DE VINS RESTAURANT STEINKELLER. Thus, we implement all the technical and organisational measures needed concerning the nature, scope and context of the personal data that you communicate to us and the risks presented by their processing in order to preserve the security of your data and, in particular, prevent the destruction, loss, alteration, disclosure, intrusion or unauthorised access to it in an accidental or illicit manner. DEBIT DE VINS RESTAURANT STEINKELLER does its utmost to combat identity theft on the Internet. That is why, for example, we use a detection system for fraudulent payments made by credit card. This system protects you in the case of the loss or theft of your credit card. DEBIT DE VINS RESTAURANT STEINKELLER reserves the right to adapt the data protection policy. When we make substantial changes to this Declaration, we publish a link to the Declaration on the home page of our website.